According to Aberdeen & Northern Marts (ANM), store cattle prices between January and March were back 16p per kg on the same period last year. The mart’s head of livestock, John Angus, said heavier types of stores were most affected. However, he was optimistic about the season ahead as grass is growing well for young store cattle to head straight outside. “Our busiest season for selling store and breeding cattle is just around the corner and we hope to sell 10,000 store cattle in the next six weeks,” Mr Angus said. Looking ahead to breeding cattle sales – the main spring show and sale of breeding heifers and calves takes place on April 30 – Mr Angus was confident breeding cattle would maintain last year’s rates, as many producers didn’t replace cow numbers in the back-end. “Due to the fodder shortages last year farmers haven’t had a chance to replace in their herds and because there have been no significant dispersals yet, there should be plenty buyers looking for breeding cattle,” added Mr Angus. ANM prime and cull cattle manager Tim McDonald said prime trade was expected to remain steady for the next six weeks, with the hope of a turnaround by the middle of May. 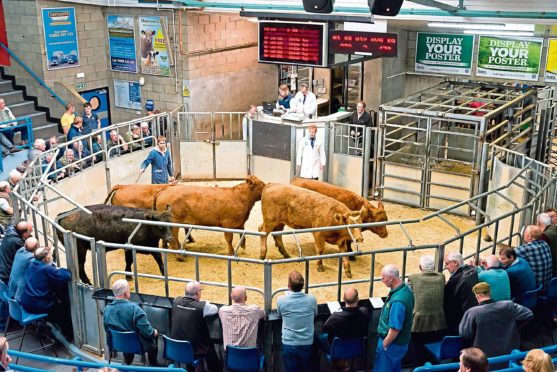 He said he had seen more dirty cattle coming through the ring than usual, due to increased bedding costs and straw shortages, and advised farmers to consider using a clipping service before selling stock. For cull cows, Mr McDonald predicted a rise in prices due to increased demand across the country. He said there were not the same number of culls forward due to producers off-loading cows towards the end of last year, and there was a “real lack” of fed cows coming through the ring.